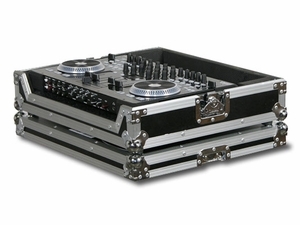 The Odyssey Flight Ready® VMS4 case is specifically designed to hold the American Audio VMS4 DJ MIDI controller. It features a front removable panel for easy access to the front input jacks and includes rubber feat, ball corners, and heavy-duty recessed handle and latches. • Controller Compartment is: 19.625" x 13"